Ananta Chaturdashi 2014 date, Anant Chaturdashi Vrat 2014, When is Anant Chaturdasi in 2014? Anant Chaturdashi is a vrat performed on the Chaturdashi day of the bright fortnight of Bhadrapad month. Bhadrapada is the Sixth month of Hindu Clender. In 2014, Anant Chaturdashi falls on Monday, september 8th. Anant Chaturdashi festival is observed in respect of Lord Anant (Lord Vishnu). This Vrat is performed to acquire lost wealth and fame. It is generally observed for fourteen years. 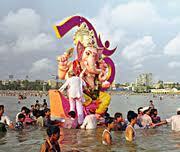 Anant Chaturdashi is the last day of the Ganesh festival, Which is celebrated for ten days. On this day, all the Ganesh idols brought into homes and communities are immersed in the sea or nearby lakes and rivers. Quite informative, relevant n useful. This is my birthday too as per Hindu calender.